- Foldable desigh, easy to carry. - 5G WIFI FPV: Real-time images and videos shot by the aircraft camera are transmitted to the screen of your smartphone via 5G network, which is fast, efficient and superior. 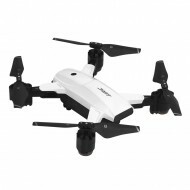 - GPS positioning and Altitude hold mode provide stable flight. - Waypoint flight: the drone would automatically follow and fly along the pointed way. - Follow me mode: the camera intelligently recognizes the user and follows the movements and action of the user.